For that much-needed storage space, but designed to look like a gracious carriage house. You’ll never want to hide this structure in the back corner of your yard! 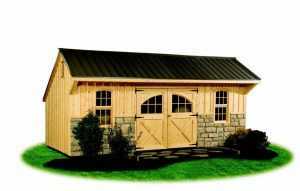 The Carriage House Series storage sheds have an authentic look, with a distinct door and window design. The hand-laid stone on the face of the building adds stunning beauty to your backyard, and they come with a lifetime metal roof available in 10 colors! They will remind you of a bygone era. The Carriage House originally gets its name from the out-buildings of large manors where owners stored their carriages. Built and designed by skilled Amish craftsmen, the Carriage House Series takes you back to the 18th century with its unique barn door look, barn hinges, and various window options. All doors and windows are custom hand made by skilled Amish craftsmen. You can choose a door or window design to fit your style. Place them where YOU want at No extra charge. Your personalized carriage house is built to your specifications, then delivered directly to your property and placed where you want it. Ask us for free expert advice on preparing your new building site, or for help with any permits you might need. 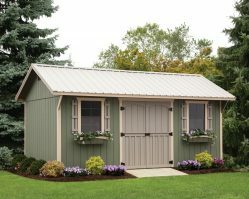 Design your own custom carriage house storage shed to match your home from top to bottom!